I want to discuss some of the interesting events going on in one of my very own reef tanks. 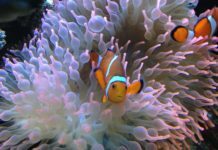 For those of you who are new to the hobby and are considering setting up a well-balanced aquarium, you may find this information useful. One year ago I set up a smaller sized tank which would primarily house small polyped stony corals such as species of the Acropora, Pocillopora, and Montipora genera. 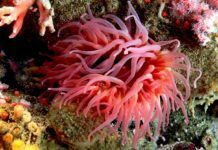 These quick-growing corals are well suited for so called micro reefs for a number of reasons. First of all, smaller tanks are much easier to illuminate. 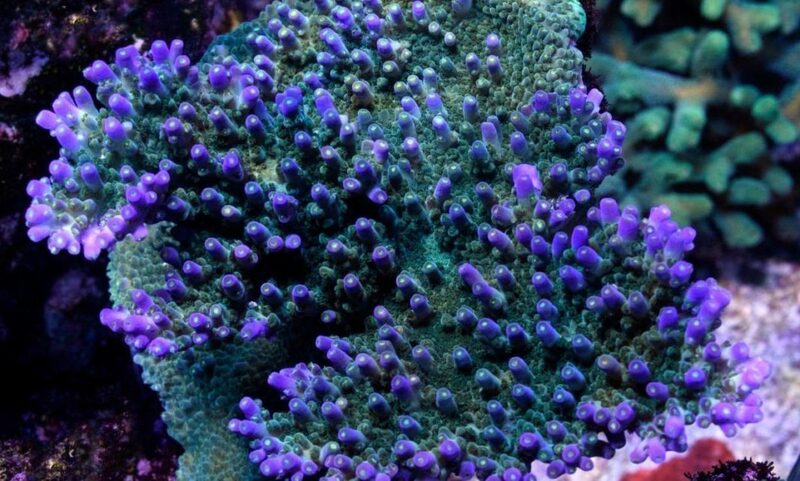 High intensity lighting, a must for SPS corals, is extremely costly. Small tanks, which are reduced in length and shorter in height, require less sophisticated lighting set-ups. Since the photosynthetically active wavelengths of light are greatly attenuated with increasing water depth, lower-wattage bulbs can produce the same affect in a short tank that higher intensity ones might provide in a larger aquarium. Your electricity bill won’t skyrocket nearly as high, and, when that time inevitably rolls around, bulb replacement should not bring tears to your eyes. Smaller tanks can also make do with some of the miniature versions of the ultra-efficient protein skimmers on the market, and will require less live rock. Another benefit of small tanks is circulation. The water movement over a natural coral reef is strong! Tidal surge, currents, and turbulence make for extremely powerful water flow. This wave action cleanses corals of sediment, mucus, and debris, and serves as a transport for scarce nutrients and oxygen. Without a doubt, the importance of water flow/circulation is one thing that all but the most advanced aquarists realize. In a small tank, the strong laminar (flow in one direction, or along a single vector) flow produced by powerheads can be easily manipulated into healthy turbulence. By aiming a few strategically placed powerheads directly at each other, you can fill every nook and cranny of the tank with exceptional water motion. The benefit of this turbulence is far reaching – coral health should increase, detritus will remain in suspension to be filtered/skimmed (no more “dead spots”), and algae growth could very well decline. It’s often difficult to achieve good water motion in larger tanks since numerous powerheads or more sophisticated apparatus must be used from a variety of angles. So those are a few reasons why a small tank might appeal to you. Here are some of the details on my set-up, which I am proud to say, is already home to two small SPS fragments. This tank is less than three weeks old and already I am very happy with it. For those of you who are interested in a small, relatively inexpensive, and fairly maintenance-free reef tank, give this a try! Some might wonder why I chose power compact lighting. To those I pose the question, “does money grow on trees?” As a thin-walleted owner of a metal halide set-up on a larger tank, I didn’t see the need to dive further into the realm of bankruptcy and spring for another HID luminary. 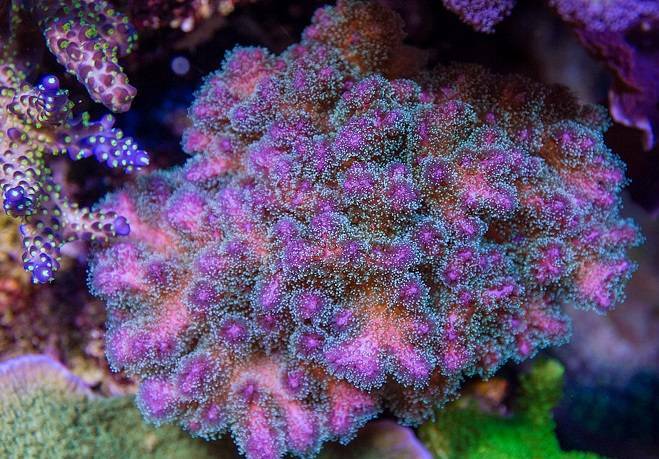 I did want to see, firsthand, just how good these power compact bulbs are, and whether or not they could keep the most light-loving species of Acropora alive. Another factor, besides money, was heat. One drawback to small tanks is that heat is much harder to manage. I knew that a metal halide system would warm the water dramatically. The heat from power compacts can be offset by a couple of reliable and inexpensive fans. First, I finished my stand and canopy with regular water based primer/paint from Home Base. I then drilled a 1″ hole in the tank with my cheap, handy Dremel motor tool and installed a 1″ bulkhead fitting. This hole serves as the overflow. I got my hands on a polyethylene storage container from a local shop for about $20 and converted it into a sump. This container is transparent and holds approximately 30 gallons of water, so my sump actually contains more water than the main tank. Inside the sump, I built a standard Jaubert-style plenum (1.5″ high) and placed a 3″ layer of the sand mix over this. I also constructed a prototype protein skimmer which sits in the sump on a few stilts. This skimmer is unlike any other design currently available, and it works so well I am considering getting it patented and selling it to the public. That is, of course, a whole other story. The sump also contains two submersible pumps – one which powers the skimmer, the other which serves as the tank return. Those who are keen and hate water leaks/spills should have noted by now that I have minimized any potential for leaks by limiting all external plumbing. I placed about 10 pounds of live rock in the sump to aid in sand cultivation, and arranged the remaining rock in a very open scaffold-type structure inside the main tank. Water circulation is accomplished through the use of three submersible power heads (flowrated at approx. 200 gallons/hour) plus the main sump return (approx. 300 gallons/hour). Water movement is very strong and turbulent. These pumps do turn off intermittently throughout the day to simulate periods of “calm.” Once again, I saved plenty of cash by purchasing inexpensive appliance timers from Home Base rather than those sophisticated wave-making devices. Will my corals know the difference? Maybe, but I doubt it. There is a 1″ thick layer of fine grade sand on the bottom of the tank, mainly for aesthetics. The power compacts are mounted 4″ from the water’s surface, and cooled by a computer fan I purchased at Radio Shack. There is no cover between the lights and the water surface. This aids in evaporative cooling and prevents the light’s intensity from being attenuated before it hits the water. Despite all the heat-producing pumps and bulbs, I am very happy to report that the water temperature remains at a constant 78 degrees Fahrenheit. Through the proper use of fans (evaporative cooling), you can usually drop a tank’s temperature by a good 5 degrees. Fans are great! As I mentioned before, I acquired several fragments of two different species of Acropora. These fragments came from two very healthy and successful mother colonies which are over two feet in diameter. They were recently clipped back since their rapid growth shaded some of the smaller corals lower in the tank. These mother colonies are illuminated by several 250 watt 6,500 K halides. One species possesses bright purple tips and the other is a furry emerald green. I am curious to see if their colors change under the less intense power compacts. These week-old fragments are already beginning to show signs of encrusting growth at their epoxy-covered bases, but polyp extension is not as impressive as in the mother colonies. I believe that this is a temporary effect due to the change in light intensity. I’ve had great success with this tank and all the SPS species have shown considerable growth during the last year. 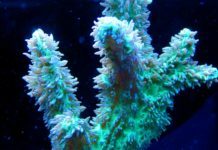 Several Acropora fragments have increased in branch size by as much as six inches!